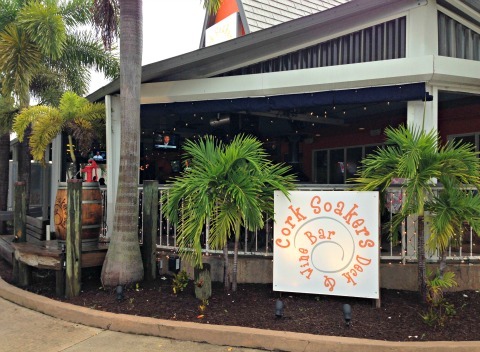 Cork Soakers Deck & Wine Bar- Grab your friends and head over to some of the best food and wine in the Cape! They are located on the corner of SE 47th Terrace and SE 8th Court, in the same building where the Twisted Conch used to be. The new owners also own the well-loved Rumrunners at Cape Harbour. They set out to draw a younger crowd with their new venture, but I think everyone will love it! 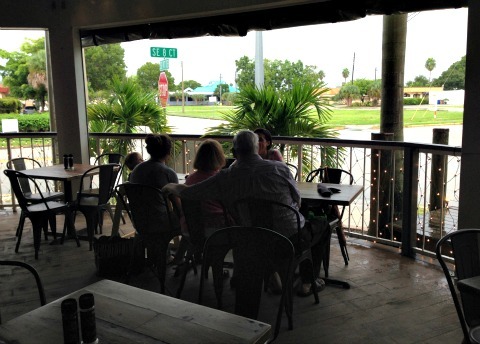 Cape Coral has exploded with fun, new and hip places to eat and drink in the downtown area of the South Cape and Corksoakers is definitely one of those places you must try. 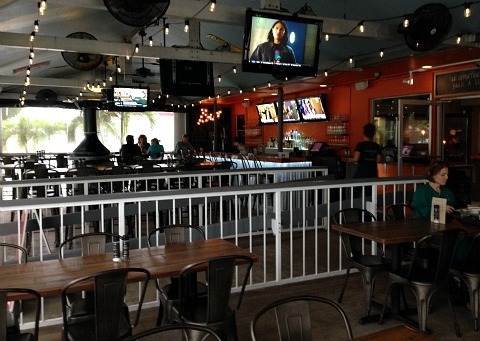 Seating is outside on the large covered deck, inside at the bar, or inside or at tables or booths. 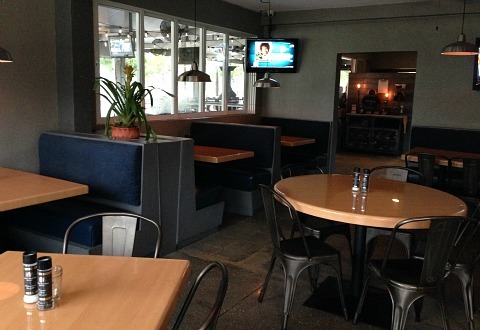 TV's are scattered throughout all 3 main dining sections of the restaurant. 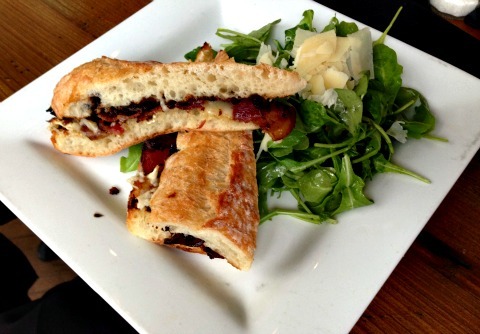 I love interesting and creative combinations of ingredients, and this menu is all about that. It's basically a list of appetizers with some of them adequate enough portions for a meal for one, and some are smaller-sized, but regardless, you'll still want to get several dishes and share them! 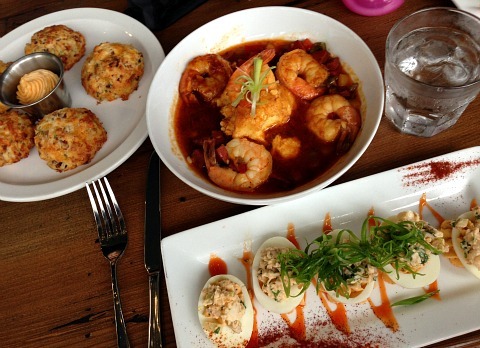 For one thing, they have a deviled egg dish of the day, called Eggs Diablo, which was Blue Crab when we went ......... delicious! We also had to try the Bacon Chive Cheddar Biscuits with Honey and Chipotle Scented Butter ..................... irresistible. I got Ralph's Killer Shrimp and Grits, in a Cajun BBQ and beer sauce over cheesy polenta ........ excellent! 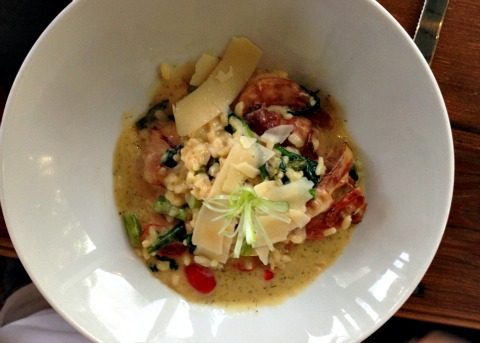 They also have a risotto of the day, which was Bacon-Wrapped Shrimp and Asparagus ......... yum. They also do a Tacos of the Day, we didn't try them but I've heard the fish tacos are out of this world. 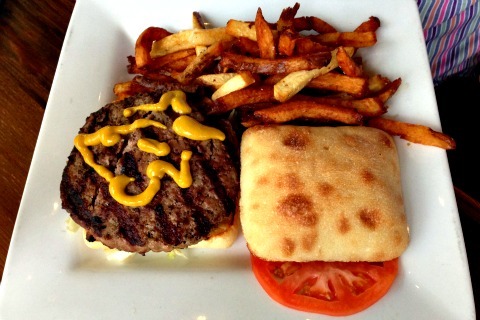 The half-pound burger is amazing, and so is the Brie and Bacon with Figgy Jam Sandwich ........... mmmmmmmmmmm. 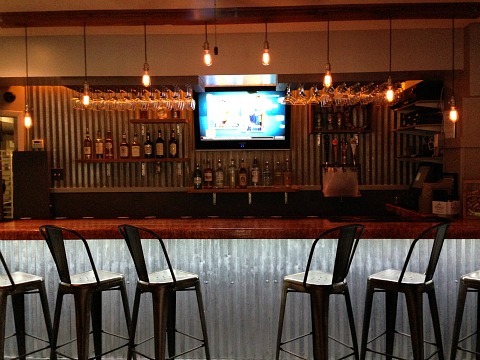 Artfully prepared and artfully displayed, you'll want to return again and again to try the food at Cork Soakers. The wine list is quite extensive, which you can get by the bottle and/or glass, depending on what you order. You can also try their specialty cocktails and on Sundays, their B*Slap Mary ...... served with bacon-wrapped shrimp, asparagus spears, pepperoncini, and a pickle. Go for live music on Thursday, Friday, and Saturdays. Cork Soaker Tee Shirt Nights are on Tuesdays, Ladies Nights are on Thursdays. They are open Tuesday - Thursday 11:30AM-11PM, Friday and Saturday 11:30AM-Midnight, and Sunday 11AM-10PM ..... and closed Mondays.